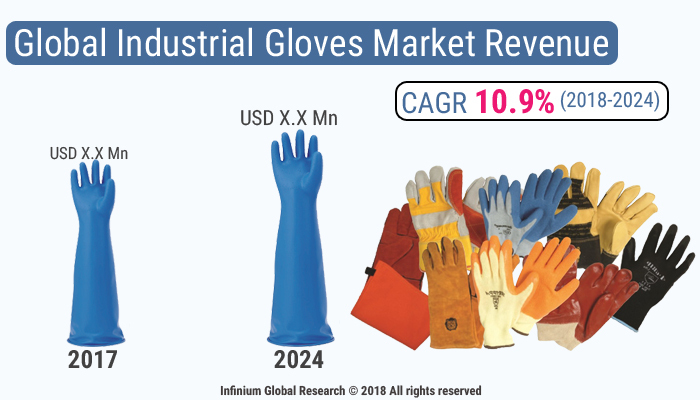 A recent report published by Infinium Global Research on industrial gloves market provides in depth analysis of segments and sub-segments in global as well as regional industrial gloves market. The study also highlights the impact of drivers, restraints and macro indicators on the global and regional industrial gloves market over the short term as well as long term. The report is a comprehensive presentation of trends, forecast and dollar values of global industrial gloves market. According to report the global industrial gloves market is projected to grow at a CAGR of 10.9% over the forecast period of 2018-2024. Industrial gloves are used to ensure safety of the employee and sanitary conditions in the workplace. Gloves are mainly composed of synthetic and natural materials. Most of the industrial purpose gloves are heat, chemical, cold, and abrasion resistant. A common material used for the manufacturing these types of gloves is nitrile. Moreover, Industrial gloves are used as a personal protective equipment in various industries such as automotive, food and healthcare to ensure worker’s safety. The main advantage of industrial gloves is that it can be disposable as well as reusable based on the requirement of specific work environment. Huge presence of manufacturing industries coupled with strict rules and regulations on industrial safety is anticipated to remain the key factor for driving the growth of the industrial gloves market. Additionally, the demand for disposable gloves is driven by the it’s low cost as compared to re-usable gloves. However, instability witnessed in the demand for rubber is anticipated to hamper the growth of the industrial gloves market. Furthermore, it is observed that nitrile gloves are replacing rubber, which in turn is creating huge growth opportunities for the key players in the industrial gloves market. These nitrile gloves are gaining popularity owing to the allergy-free properties, puncture resistance and durable properties. Among geographies, North America dominated the global industrial gloves market followed by Europe. The Europe and North America has recorded almost two-third of the total market revenue and increasing awareness regarding the workers safety is anticipated to aid the maintaining regions market position. North America is developed with huge end-user industries owing to the strict regulations for the safety of the labors. On the other hand, rising automation over the American jobs and very soon, there will be no worker working in the manufacturing and other end-use industry. Furthermore, because of automotive and steel industries and industry chemicals these gloves are scheduled to observe high demand in the Asia Pacific regions. The report on global industrial gloves market covers segments such as, material and end user. On the basis of material the global industrial gloves market is categorized into natural rubber gloves, vinyl gloves, nitrile gloves, polyethylene and neoprene. On the basis of end user the global industrial gloves market is categorized into aerospace, flat panel, disk drive, medical devices, semiconductors and pharmaceuticals. The report provides profiles of the companies in the global industrial gloves market such as, Semperit AG Holding, Top Glove Corporation Berhad, Rubberex, Hartalega Holdings Berhad, Towa Corporation, Shamrock Manufacturing Company Inc, Superior Glove, Ansell Healthcare, SHOWA, Inc and Honeywell International Inc. The report provides deep insights on demand forecasts, market trends and micro and macro indicators. In addition, this report provides insights on the factors that are driving and restraining the global industrial gloves market. Moreover, IGR-Growth Matrix analysis given in the report brings an insight on the investment areas that existing or new market players can consider. The report provides insights into the market using analytical tools such as Porter's five forces analysis and DRO analysis of industrial gloves market. Moreover, the study highlights current market trends and provides forecast from 2018-2024. We also have highlighted future trends in the industrial gloves market that will impact the demand during the forecast period. Moreover, the competitive analysis given in each regional market brings an insight on the market share of the leading players. This report will help manufacturers, suppliers and distributors of the industrial gloves market to understand the present and future trends in this market and formulate their strategies accordingly.